Isn’t it nice when things work out as planned? It doesn’t seem to happen nearly as often as it should, but this month it did. Last month, I only managed to make one block for The Hexagon Project. My plan for improving that rate was to sew during my lunch breaks. And I’m happy to report that I sewed three English paper piecing hexagon flower blocks this month, for a total of 17 blocks to date. Seventeen blocks are enough for a baby quilt! It feels like such an accomplishment to lay out the blocks and start to envision them coming together. I like to have some color combinations ready to go so I can easily add them to my project bag. My supply was getting low, so this week I planned ahead for another 30 or so blocks. If you’ve been reading about this project from the beginning, you know that I originally cut hexagons from my smallest pieces of scrap fabric. As a result, I have a lot of certain fabrics but very little of others. 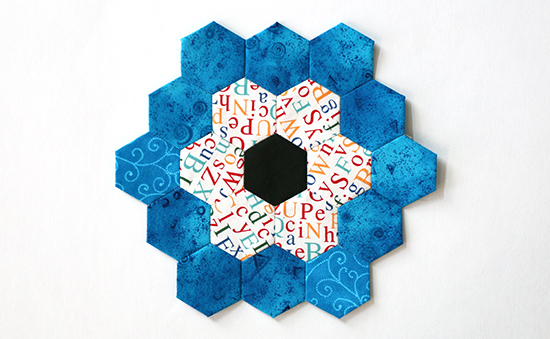 As I use up these pre-cut pieces, it’s a challenge to group the colors and prints of the remaining hexies. As much as I don’t want to make this project more monumental than it already is, I think cutting more fabric pieces is in my future — but with more than 30 blocks ready to go, not in my near future. For now, I’m going to stick with the plan: I’ll keep sewing through my lunch breaks and believing that it will all work out. Beautiful! 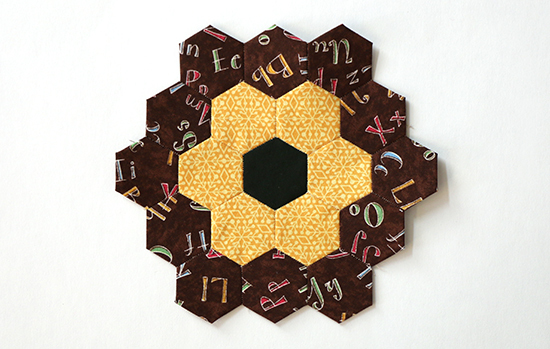 I started a hexie project using 1" papers about four, yes 4, years ago. It's still a WIP that I only work on at violin lessons, doctor visits, chemo sessions, etc. I love the vibrancy of your blocks and look forward to seeing the finished quilt. Happy quilting! Thank you! 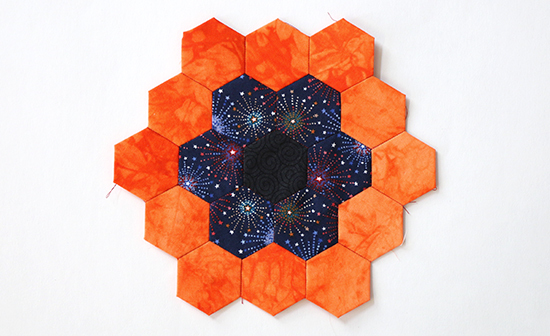 I like that the hexies can be taken almost anywhere to sew a little at a time. it’s nice to have something extra to show for the time spent at all of those appointments. Happy quilting to you, too! Love your hexies. I've started making them 2 weeks ago, it's very relaxing to do at night in front of the tv, very addictive:) Looking forward to see how you put them all together into a quilt. I bought a hexie punch at Joannes on sale for less than $10. It works great and much faster and easier than hand cutting...it's very heavy and sturdy, I couldn't beleive how great it works. Thank you, I find it relaxing also. And since I chose the color combinations ahead of time, there's a little surprise to starting each block. I've heard good things about those punches and keep meaning to pick one up. I'll probably remember just in time for the end of the project!